iOS 12 brought forward a plethora of new additions to the table. Out of the entire list, Screen Time can easily be regarded as one of the most prominent ones. The new area offers a bevy of personal data that an individual can make use of in order to break down the amount of time you spend on your iPhone or iPad. There are numerous tools in the new Screen Time feature such as Limit Time for apps, Downtime, and infographics which is the visual representation of your usage pattern. 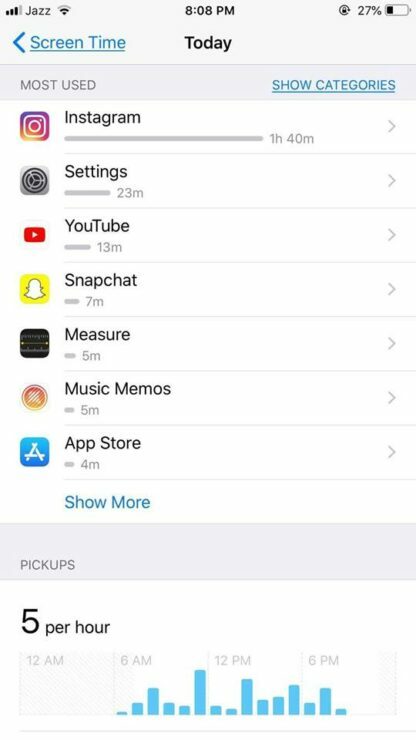 The new Screen Time section in iOS 12 Settings basically allows you to look at how you use your device. It also details how many notifications you are receiving and how often you check your phone. While being pretty straightforward, the Screen Time addition could potentially allow you to reduce the accessive time you spend on your smartphone or tablet. 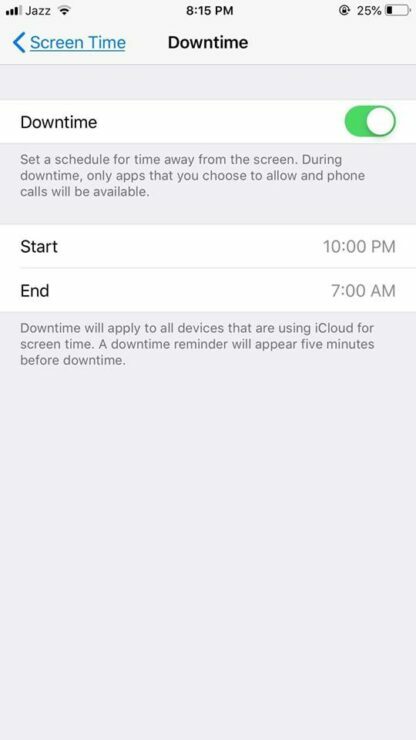 If you’re unfamiliar with the functionality, we will let you know how to operate Screen Time, Set Time Limit for apps as well as curating Downtime apps. 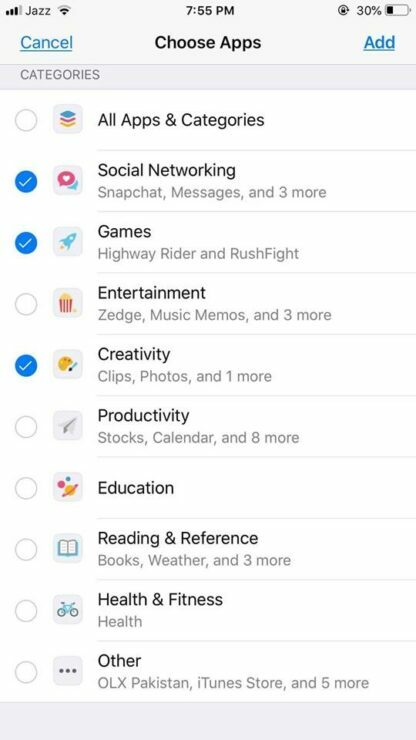 The first thing that you have to do is head over to the stock Settings app on your iPhone or iPad then tap Screen Time. Enable the feature if you haven’t already. In this section, there are several options available. You will be presented with the usage information for your current day so far. The total time you spent on your smartphone is presented above the horizontal bar which details different categories of your usage. You can have a deeper insight by tapping on the time. There are two time frames available – Today and the Last 7 Days. This section also shows the time you’re spending on a specific website. Other than this, scrolling down would reveal more information on how many times you have picked your phone. 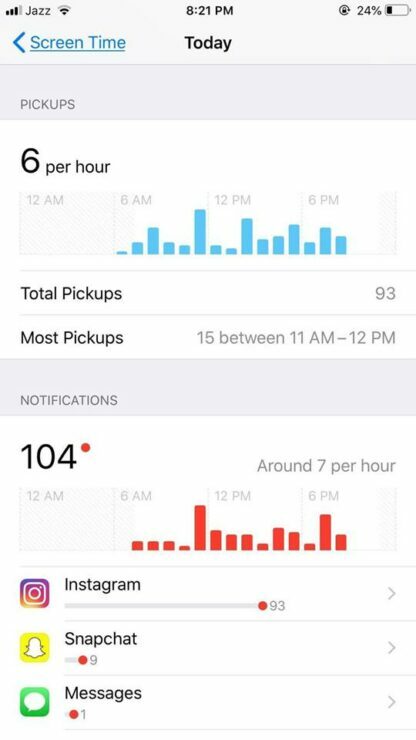 Just turning on the screen of your iOS device doesn’t count as a pickup. You must interact with the on-screen content to mark a pickup. Further below the pickup count per time is the notifications section. The feature shows the total number of notifications you received as a total for the day. It also has an hourly average and per-app notification count showing which one of them is alerting you often. The new Screen Time feature in iOS 12 will also notify you the summary of your weekly notifications. If you’re a parent, the information could pose helpful in analyzing your lid’s usage patterns and habits. App Limit is self-explanatory. You set limits for apps and there is also set it up with a family account to monitor how your kids use iOS devices. Setting app limits is easy. Here’s how you do it. 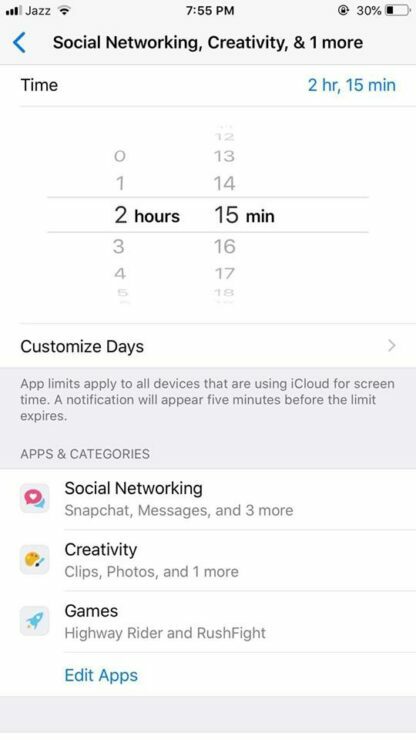 Step 1: Simply go to Settings > Screen Time > App Limits. Step 2 (a): Over here, you can set a time limit for the entire category of applications like social networking and more. 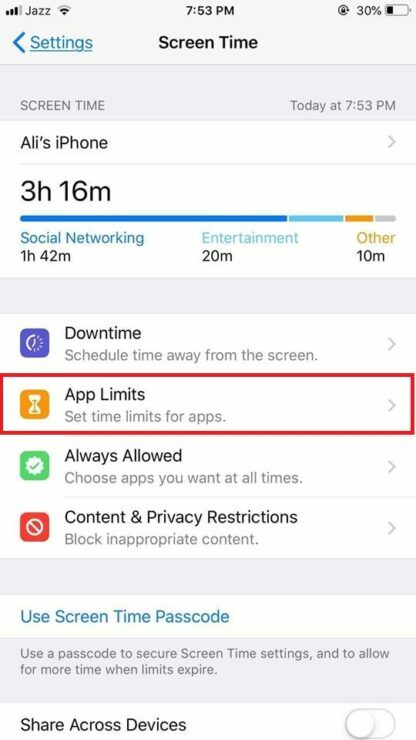 Step 2 (b): If you want to restrict certain apps navigate to the Screen Time and select the app you want to set a limit to in the “Most Used” list. An “Add Limit” option will be available at the bottom of the screen. Step 3: Select the amount of time you want to allow for the specific app or category. The feature works on a 24-hour basis and the clock restarts at midnight. Before your time is about to run out you will be reminded with a notification with an option for parents to extend the time by 15 minutes or ignore it. You can also set a four-digit password which will be used to extend timers. Downtime another unique feature which stems from Screen Time. 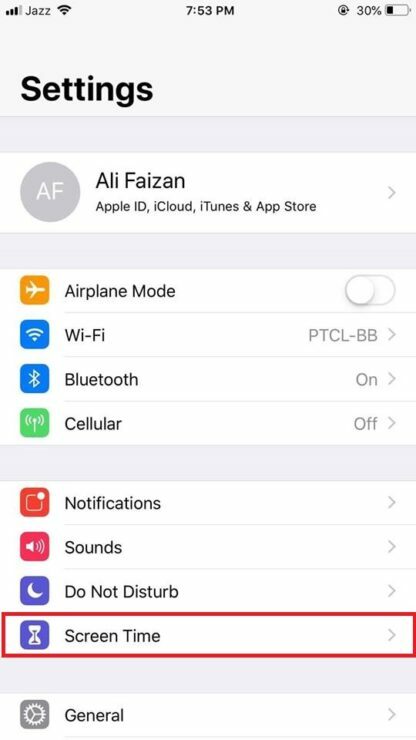 It allows individuals to cut their accessive usage routines on all apps with certain apps reserved like Messages or the Phone app. There are other apps as well which you can add or remove at will. Here’s how to set it up. 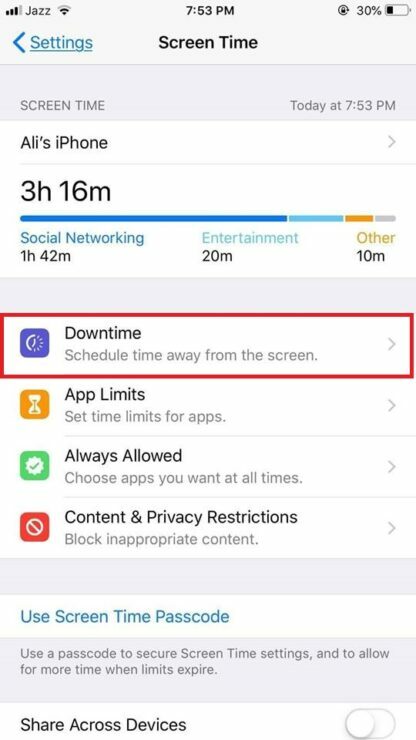 Step 1: Launch the Settings app > Screen Time > Downtime. Step 2: Now simply choose the time you want for Downtown to begin and when it should end. That’s it. You can set apps to be always available and also block inappropriate content. The new Screen Time is definitely a pretty neat addition in iOS 12 and it will be pretty helpful for parents as well as personal use. Check out the feature for yourself or for your family. There will be more to the story, so be sure to stay tuned in for more details. 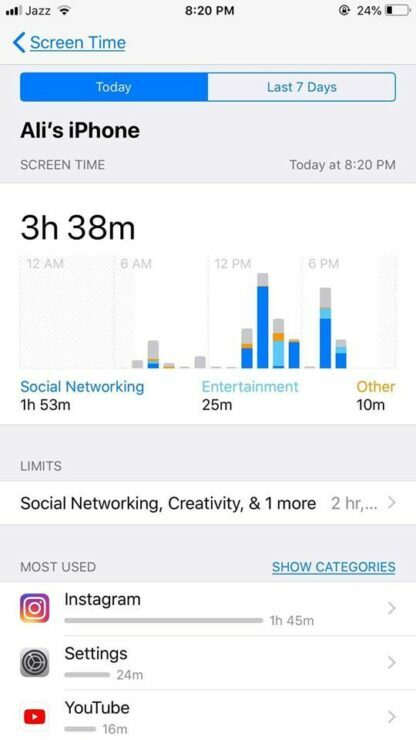 What are your thoughts in the new Screen Time feature in iOS 12? Let us know in the comments.